When I arrive in a new place, I don’t like to have a quick meal at the first restaurant that catches my eye. The food usually turns out to be disappointing and the service even worse. Being stuck in a bad tourist-trap restaurant is such a waste of a first evening in a new and exciting town. Instead, I like to take the time to enjoy a really nice meal. It doesn’t matter whether it’s a four-course event at a fancy place, or a hole-in-the-wall take-out. I’m determined to find something that I’ll enjoy, and fits the occasion. With the multitude of review books, sites and even (offline) smart phone applications available it’s pretty easy to find something within walking distance on the fly no matter in which corner of the world I’m staying. Food is often, in addition to transportation and hotel accommodations, regarded as the biggest contributor to overall cost of the trip. Common sense tells us it must be really expensive to eat in large metropolitan cities like New York and Tokyo, just to name a few. I decided to test this out and traveled to New York, for the first time in my life, on a very tight budget. I was working my way through college at the time, which should say enough about the amount of money I had to spend: virtually nothing. I spent my entire savings account on a pre-packaged hotel and flight deal, which at the time worked out well for me. All I had left for pocket money on the trip was the contents of my piggy bank. Those pennies had to last about a week and buy me meals in a city that’s considered one of the most expensive in the world. Since New York, and North America in general were both completely new to me (I hadn’t traveled much beyond my home town at this point in my life) many things I’m now familiar with were something I really enjoyed at the time (and still do, actually). For me, being in New York was all that really mattered. My first breakfast in the city that never sleeps was a croissant and coffee from a stall on the street corner. I saw people pick up their coffees and breakfast pastries from there on their way to work, so I acted like the locals do and lined up to get my share of the street corner goodness. Admitted, street food always smells better than it tastes, but nonetheless I enjoyed the experience and huge cup of coffee that I got out of the deal. That was followed by a large coffee from the hotel take-out bar the next morning, and on the third day I “treated” myself to a sit down breakfast in a small diner tucked away in some side street I saw the night before. Again, I found myself surrounded by locals who quickly stopped in for a bagel on their way to work. That diner was my first bottomless coffee experience in my life, one I’ll never forget simply because I wasn’t used to the novel concept of free refills. Total cost for my “expensive” treat-myself breakfast was well under ten dollars. Most lunches and dinners on that particular trip were equally cost-efficient. As a European resident I wasn’t very familiar with another North American concept: food courts. I really enjoyed the cheap but decent food, together with locals on their way home after a long day in their skyscraper offices. I did enjoy a few “sit-down” dinners, however most of those were in relatively cheap Italian restaurants a block or two away from the busy main streets. By avoiding the main streets most of the time when I was looking for food I found some fantastic meals, for a very affordable price. I learned that to find good, or at least decent food, I sometimes have to go off the beaten tourist path a bit, and maybe adjust my expectations when needed. All that really mattered to me was to be in a place so far away from home, and take in the sites and some of the attractions I wanted to see. This model of traveling became one my first “best travel practices” for my future journeys. Being there is what really matters, and as long as I managed to stay well fed, not go hungry or starve I was doing great. The art of traveling to a place completely foreign to me, and managing to get something to eat and drink, even when I don’t completely understand the language, or don’t have a lot of money to spend, is one of those small victories I still enjoy every time while traveling. In later trips, my budget was based on a corporate expense account and therefore not as strict as before. I learned it can also be a lot of fun to enjoy a good food experience in some of the finer restaurants. It would be a shame to miss the unique eating opportunities that a lot of destinations have to offer. It’s all about finding the right balance. On subsequent trips to the Big Apple I’ve enjoyed some great meals outdoors on the long summer nights in Battery Park, watching the sun set over the Statue of Liberty. Needless to say this was a bit of a different experience than my beloved food courts, which comes with a different price tag. It was well worth it. On the other nights I still ended up going back to the cheaper places that I remembered from my first trip. In the end, my expense reports were claimed to be well below the average for the company, despite the many nice things I treated myself to. Want to read further? 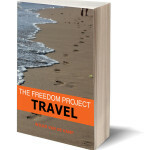 Find my best selling travel book on Amazon, Barnes & Noble or at finer book retailers worldwide. You can also buy it directly at FreedomProjectBook.com.